Every word has an origin somewhere. In climbing there are tons of interesting words and most of them probably came from interesting places. As there are too many interesting words to cover in a short blog, I've chosen three, Belay, GriGri and Arete. As climbers we use the word belay every day. And those of us who sail or work in theaters know that the word is occasionally used in other settings as well. Belay is a word that was derived from the Old English word "belecgan." The original literal meaning of the word was: to surround a thing with objects. It was commonly used figuratively to refer to an kind of encircling or coiling around something. Over time this evolved into a nautical meaning, "to secure a length of rope by wrapping it around a cleat or pin, especially a rope attached to sails." It wasn't until the 20th century that belay took on the meaning, "to tie oneself, as a stationary member of a roped party, to a firm rock projection, or to piton, in order to secure oneself and to afford a safeguard to the moving climber." Source. Yes, we all know the GriGri as a mechanical belay device. But most people probably aren't aware that the term grigri is derived from Voodoo. Yep, the same mysticism that gave us pin dolls and zombies gave us a term that we use every day in climbing. According to TheMystica.Org, "gris-gris resemble charms or talismans which are kept for good luck or to ward off evil. Originally, gris-gris were probably dolls or images of the gods, but presently most gris-gris are small cloth bags containing herbs, oils, stones, small bones, hair and nails, pieces of cloth soaked with perspiration and/or other personal items gathered under the directions of a god for the protection of the owner." As climbers we often feel like we get to summits or finish routes because we were lucky one day. And indeed, whether a climber is religious or not, most feel some kind of a spiritual connection to the mountains when they get to the top of something. As such it makes a lot of sense for the marketing people at Petzl to name a device after a mystical good luck charm. Arete is generally thought of as a French word that means "a sharp, narrow mountain ridge or spur." Climbers generally use this word as such. Often we use it interchangeably with buttress or ridge. The word arete was derived from Greek. It originally meant the goodness or the virtue of a person. Answers.Com notes that, "in the thought of Plato and Aristotle, virtue is connected with performing a function (ergon), just as an eye is good if it performs its proper function of vision. This is its telos or purpose (see also teleology). Aretē is therefore identified with what enables a person to live well or successfully." For a climber this makes sense. An arete is often a line of weakness in a feature. These are also often considered "good" or fun lines. Knowing the background of climbing words will not make you a better climber. It will not allow you to fit your fingers into a tinier crack or crimp a smaller hold, but it will give you something cool to talk about at the crag. And really, part of the fun of climbing is talking about cool stuff with people you meet at the crag...! 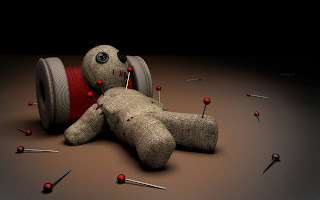 i am Haitian, and Vodu "voodoo" has little to do with what you think it does. there are no actual voodoo dolls, the grisgris is a spiritual pouch, usually a charm for safety and good luck.